With Fred along to help, and the good weather, what else is there to do but splash blue paint about? 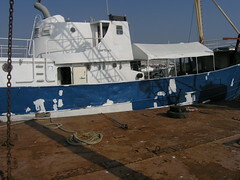 The starboard side has now been touched up with blue, with the exception of a small white patch up forward I just could not reach. The wind and the tide both conspired against me on that one. There is still a strip down by the waterline at the stern that needs priming and painting, so when I get blue paint on that, I'll also get the missed patch. I know I'll have to get that patch, as it's amazing how many people feel free to comment as they go past in their boats. I don't think I could bear to hear "you missed a bit" too many more times. 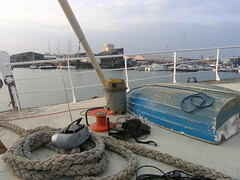 It's probably the warm, still evenings when I like being on Lady Jane best at the moment. 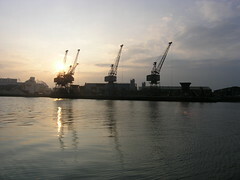 Ok, I know the background could be a dramatic sunset over an iceberg in Labrador, or some other similar natural wonder. No matter, I'm here on the Itchen and loving it. Once all the manic daytime traffic has died down, the place can be quite peaceful. Nothing like sitting on deck with Pat in the warmth of the evening sunlight, along with a barbecue emitting mouth watering aromas and a cold beer or two to hand. I've made a start on welding those cracks on deck. 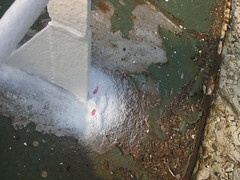 The picture shows the typical scenario, cracks right at the base of the stanchions which hold the deck rails (the red marks in the white powder). Those cracks have caused the steel plate on either side of the deck to waste away, and in turn have caused massive corrosion in the bow plate below as well. What happens when I try to weld over the crack is that once the weld cools down, the thin steel to one side of the original crack cracks open. I've welded some of the cracks successfully and re-welded some of the new cracks successfully, but on one of the stanchions I will need to weld yet another crack that has opened up. Unfortunately this approach is obviously not going to work, as that steel is so thin it's only a matter of time before it cracks open again, no matter how much welding I do. Robin has done one for me, but it looks like I have no option but to cut back the old wasted sections and weld new steel plate under every single one of those stanchions, plus add a footing plate to stop this happening if the rails ever get another knock at some point. All a much bigger task than I was anticipating, as I have seven of them to do. At least this will help build my welding skills. Here is a welcome sight, Fred back and helping to keep me honest. Fred has been away on a three month project, researching the quality of various Antipodean wines from the comfort of a rented pool in Western Australia somewhere. 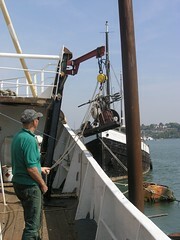 That big lump you can see being hoisted on board is a compressor, the start of a 204 volt compressor system for general duties on board and a backup for the boat's main compressor. 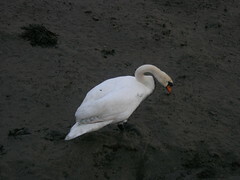 I've always been wary of that mud in Fareham Creek. "At 10 minutes to 5.00 pm this afternoon Solent Coastguard were informed by Hampshire Police that a 38 year old man from Porchester needed urgent assistance who, at that time, was stuck in an area of Fareham Creek. The report suggested he was ok but could not move as the mud was at the top of his waders, and as he struggled he became deeper in the sticky mud." 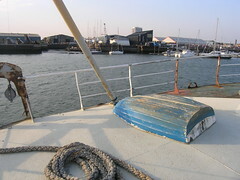 The plan is to get going rust busting and painting on the port side as soon as possible. Before work on the port side can start, I need to turn Lady Jane around, so she is facing down the river. Turning Lady Jane will have to wait until the starboard side has been touched up. The touch up work is well under way, hence the patchwork quilt effect you see. 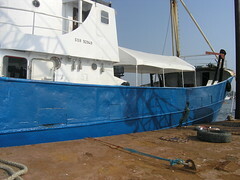 I'll also set about getting a second coat of blue onto the starboard side. I really miss the convenience of the platform I was using, that crane is not going to be easy for me to move relative to Lady Jane. Almost by chance, I discovered that you can get what is known as a flaw detector kit. The idea is that the kit can be used to detect cracks in welds, or cracks in materials that need welding. In my case it's perfect for finding out exactly where the holes in the deck are that have caused all that corrosion down in the forward hold. The problem has been that I have rusty patches in the deck head, but no idea of exactly where the water is leaking in from the deck above. Enter the flaw detector kit, and a squirt or two of that red dye onto the rusty patches. What happens is that the red dye seeps into the cracks, or holes, and through capillary action works it's way to the other side. In fact that red dye gets everywhere very quickly. Judging by the state of my hands and the place, any visitors would be excused for thinking I had just committed some kind of horrendous crime in the forward hold! 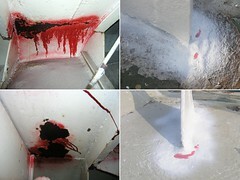 To really make the dye show up, you spray a fine white powder around the suspect area. This, as you can see, contrasts really well with the red, showing exactly where the source of the leak is on the deck above. Interestingly for me, the red dye even worked it's way through what I thought to be three layers of good primer. Now I know where the holes are, it should just be a matter of welding them closed. The newly straightened rails, both port and starboard, have now been welded back in. Here you see the rails after the benefit of a lick of primer. There is some way to go in completing the painting of the rails, but the back of the job has been broken. That top rail still needs sorting, but I'll do that separately once I can lay my hands on a pipe bender. I suppose I could also sort out the top rail on the back deck at the same time. Sitting on deck, enjoying the sunshine and ambiance made me think "this is too good not to share". Who better to share it with than my folks? 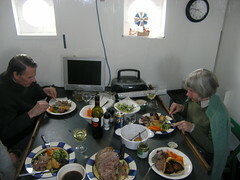 Here you see my folks, inside my blog, just about to tuck into a somewhat late lunch on board Lady Jane. Special thanks to Pat for cooking us all a wonderful meal. This recent fine weather has been an excellent opportunity to get up on that front deck and straighten those bent rails. Based on the comments I've had, I know more than one reader will be pleased that I've finally got around to doing this. The rail work is in preparation for finishing rust busting and painting the front deck itself. Straightening those rails is not as easy as you may think. The bent rails need to be cut off and straightened, after heating the bent bit to cherry red. They then need to be cut back to length, as they stretch with bending. After the lengths have cooled, the ends must then be ground, so they can be welded back in properly. The picture shows the gaps in the rails where they've been cut out for straightening. Sadly, the really bent top rail at the bow will need to wait a while, as it's going to need a pipe bender and some serious effort to sort out. 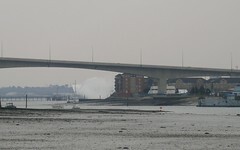 Towards the end of the day, I happened to look down beyond the Itchen bridge and saw this fire fighting tug strutting it's stuff in Southampton water. I've no idea why the spray, a practice of some sorts? Nothing showed up on any Internet searches I did. I knew that by the time I got the rib fired up and went down to investigate it would all be over. Sure enough, just minutes later the show was over. With it being cold and windy, it's just not been practical to do much of anything, except mess about. The newly discovered Sotonmet website archives show an average wind speed of over 22 knots for both Saturday Sunday (thanks Richard). 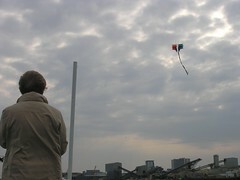 Here you see Pat struggling to control my capricious kite from Lady Jane's back deck. The kite been kicking around, unused, in the fish hold for some time now. All things considered, it's survived the last couple of years pretty well. This kite needs a pretty stiff breeze to stay up, so no problems there then. The reaction of other folk going by in their boats, from amusement to simply ignoring us, was interesting.